An artful blend of the old and the new, Mattei’s Tavern is a throwback to a fascinating time in California’s history when this iconic watering hole catered to weary railroad travelers. In its most modern incarnation, Mattei’s Tavern is one of entrepreneur Charles Banks’s many projects. At times, the Central Coast seems like a bit of a cultural wasteland when it comes to great food and wine. Banks is out to change that with a highly ambitious plan that includes the development of around 60 luxury suites. Los Olivos is a beautiful, quaint town full of tasting rooms teeming with visitors, especially on the weekends. I always wonder where all the tourists stay. Fess Parker’s Wine Country Inn is first-rate, but it is also small. Banks's new hotel could very well become for Los Olivos and the surrounding towns what Meadowood is for St. Helena and Napa Valley, which is to say a flagship property that raises the entire area to a new level of prominence. Banks recruited Chef Robbie Wilson and his wife Emily to run the kitchen at Mattei's, while Stephane Colling oversees one of the most intriguing winelists in California. The Wilsons installed a modern, open kitchen that is a nice contrast to the dining rooms, which are pretty retro in their look. Similarly, the menu combines elements of the old and the new, including a handful of dishes from the ‘1886’ menu that take their inspiration from Mattei’s early days. Robuchon, Boulud, Ducasse. Sommelier Stephane Colling has worked with them all. Colling’s winelist is worth a visit on its own, if nothing more to explore the amazing range of Mayacamas Cabernet Sauvignons offered at what are exceedingly fair prices in today’s market. Jewels from the Rhône, Burgundy and elsewhere are found throughout the list, but they aren't inexpensive. I suggest focusing on the large selection of local wines, although a number of small production Champagnes on the list, especially those from Agrapart and Bérèche, are pretty hard to resist. Dinner starts with the octopus a la plancha and the beef tartare, both from the ‘1886’ menu. The octopus is fabulous, while the beef tartare is very good, but also heavily seasoned to the point the beef itself is hard to taste. As for the barbeque potato chips, well, they are dangerous. The grilled avocado with ponzu and fresh wasabi is a signature dish. Don't miss it. Our main courses are even better. The short rib pot roast is absolutely delicious, with intense flavors but no sense of heaviness whatsoever. 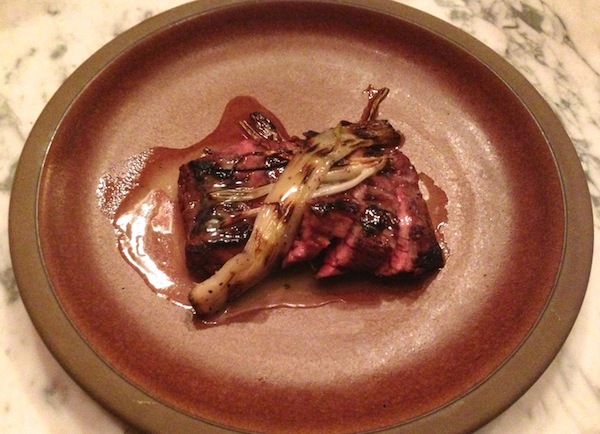 Heartier, richer flavors come through in Wilson’s bavette steak with torpedo onions and smoked fish sauce, another dish I highly recommended. 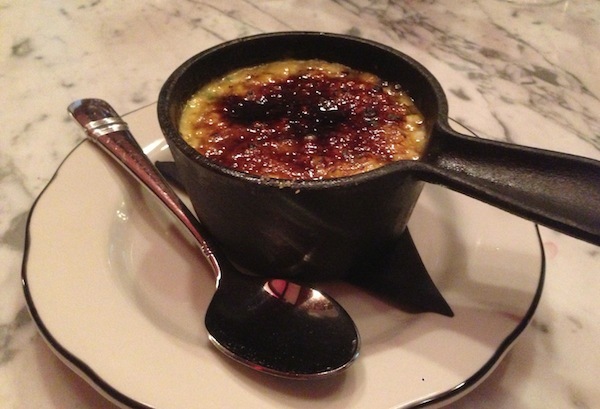 I also love the cream corn brûlée, which is classic Southern comfort food at its very best. Liquid Farm’s 2011Chardonnay Golden Slope is rich, layered and beautifully resonant in the glass, with all of the depth typical of Sta. Rita Hills Chardonnays on this vintage. Broad and ample on the palate the 2011 impresses for its overall balance and pure texture. Ideally, the 2011 needs to be opened at least a few hours in advance, as it is still pretty tightly wound. The 2011 Pinot Noir La Encantada Vineyard from Tyler and Justin Willet is a revelation. Much more expressive then when I last tasted it, the 2011 has since blossomed into a complex, incredibly vivid wine. The wilder, gamier notes typical of La Encantada are present, but the sheer richness of the fruit provides a compelling counterpoint. The Encantada is a gorgeous Pinot with more than enough structure to stand up to even the richest of foods. Quite honestly, the more I taste, the more I am convinced 2011 is a better vintage for Pinot Noir in most, if not all, of the major appellations within the Central Coast. This is an absolutely striking Pinot in every way. Readers who have seen Napa Valley and Sonoma and want to explore a different side of California should make a point of spending some time in Santa Barbara County, where some of the best and most intriguing wines in the state are being made. A dinner at Mattei’s Tavern is the perfect way to wrap up a day of tastings.